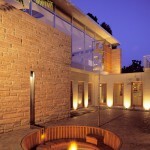 Gas fire pits are can be of various types. They may range from holes dug in the ground to a burning structure made of metal, stone or brick. The essence of a fire pit is to provide warmth from the blistering cold weather in the house or outside and are designed in various ways to serve this purpose. So if you’re looking for a gas fire pit to provide warmth during those cold or chilly evenings, you’ve come to the right place because below we review some of the best gas fire pits for heat- propane gas fire pits to be more specific. Propane gas fire pits, are known to be the more convenient option of wood burning fire pits as they produce a cleaner and smokeless fire at just the turn of a button, all the while allowing you the benefit of regulating and adjusting flames and heat produced to your liking. 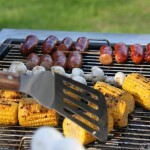 Space available: One of the safety guidelines to strictly adhere to when using a propane fire pit is space. 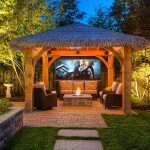 The space available in your outdoor living space can sometimes put a restriction on the size of propane fire pit you can get especially if the space available is limited. 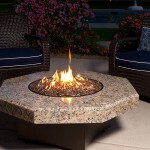 Style of fire pit: Fire pits come in different sizes, shapes, and styles. There are fire pis that you can cook on, some that can be converted to tables and others that serve a decorative purpose in addition to providing warmth. You can check through these different types to find the one you prefer and will serve your purpose. BTU rating: The BTU rating of the fire pit will give you an idea on the maximum amount of heat that your fire pit will be able to dispel. But is also worth noting that BTU rating alone may not be enough to determine the warmth production of your fire pit. You may find a fire pit with a BTU rating of 40,000 able to produce more heat than a 50,000 BTU fire pit because there are more factors that will come into play for a fire pit to produce optimal heat. You can read more details on these factors on this article. Outland is a very popular brand when it comes to making top quality portable propane fire pits and this is just one of the best of the lot. It is a highly rated 19” diameter fire pit is a lovely way to bring warmth and create the perfect ambiance to a cozy evening outdoors. This fire pit has a 58,000 BTU rating and is made from top quality steel with a powder coating and enamel finish which ensure prolonged use and added durability. Portable is the correct word to describe this fire pit as it is quite compact and lightweight which makes it easy to carry with you wherever you want to go. It can be set up quite easily without the need for any extra tools. 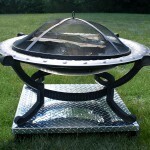 One of the highest and most popular portable gas fire pits. 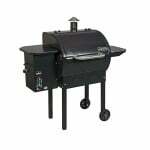 Durable through seasons of daily usage- The frame, stainless steel burner and fasteners and all made from high quality steel to guarantee this. The protective enamel coating also enhances durability. 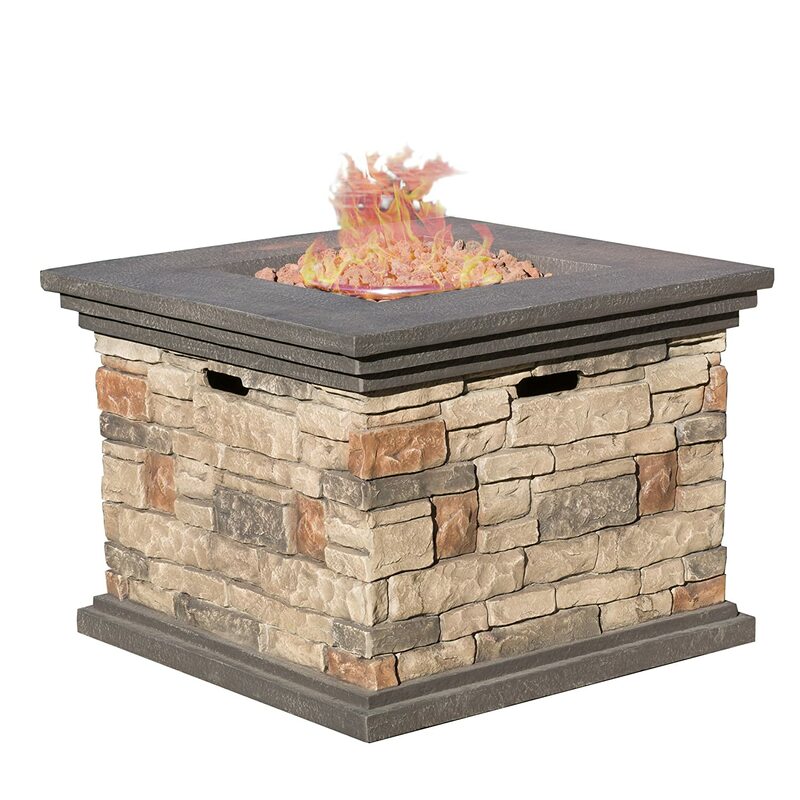 Includes essential fire pit accessories- Includes lid cover to protect and cover the interior parts when the fire pit is not in use, a carry kit for easier portability and natural lava rocks to accent the fire pit for more realistic looking flames. Light weight and easy to carry around- It weighs just 23.3 lbs. Can be converted to natural gas-With the help of a natural gas conversion kit 780 that you purchase separately. Customers rate this fire pit for its durability and ability to produce a lot of heat to keep those seated around it warm and toasty! With a BTU rating of 58,000 this easy to use outdoor propane fire pit is the perfect companion for all types of outdoor activities from camping to tailgating to just a regular backyard fire, with very high consumer ratings to attest to that! Not only is this fire pit designed to deliver clean fire, but it also durably created with high quality steel and delivers enough heat to warm up your outdoor gathering for a cozy evening. It comes with a 10 feet hose and decorative rocks to add to your pit, convenient carrying straps for easy movement and a protective fire pit cover lid to protect the fire pit from debris and weather elements when it’s not being used. Produces enough heat to keep those around it warm. It is one the most popular gas fire pits with very high ratings. Made from superior quality materials for long lasting durability. 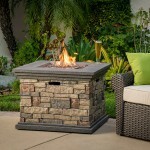 Includes other fire pit accessories such as a cover and fire pit rocks. 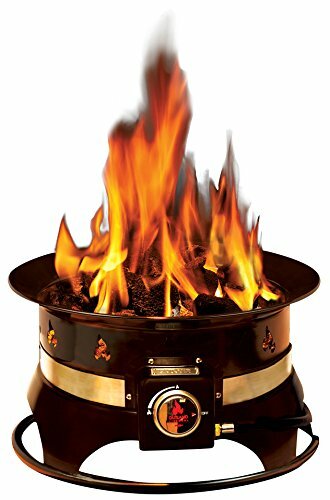 Customers highly recommend this fire pit for the amount of heat it puts out with comments such as “plenty of heat”, “substantial amount of heat”, “good amount of heat” and “lots of heat” used to describe the heat produced. With this 19” diameter fire pit you get 58,000 BTU of warm cozy heat that not only provides warmth but adds the perfect ambiance to all type of outdoor occasions whether it is a campfire or just a backyard. 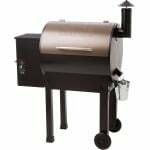 It is ergonomically designed with superior quality stainless steel fro the body, burners as well as fasteners and a chrome knob with a comfortable rubber grip all of which makes it quite easy to operate and adds to the durability. 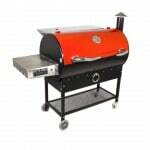 Durable high quality steel construction with protective weather and heat proof coating. Lightweight and compact design allows for easy movement on the go. 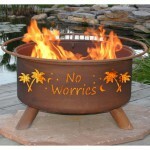 Includes a lid cover with carry straps and fire pit rocks for accenting the flames. 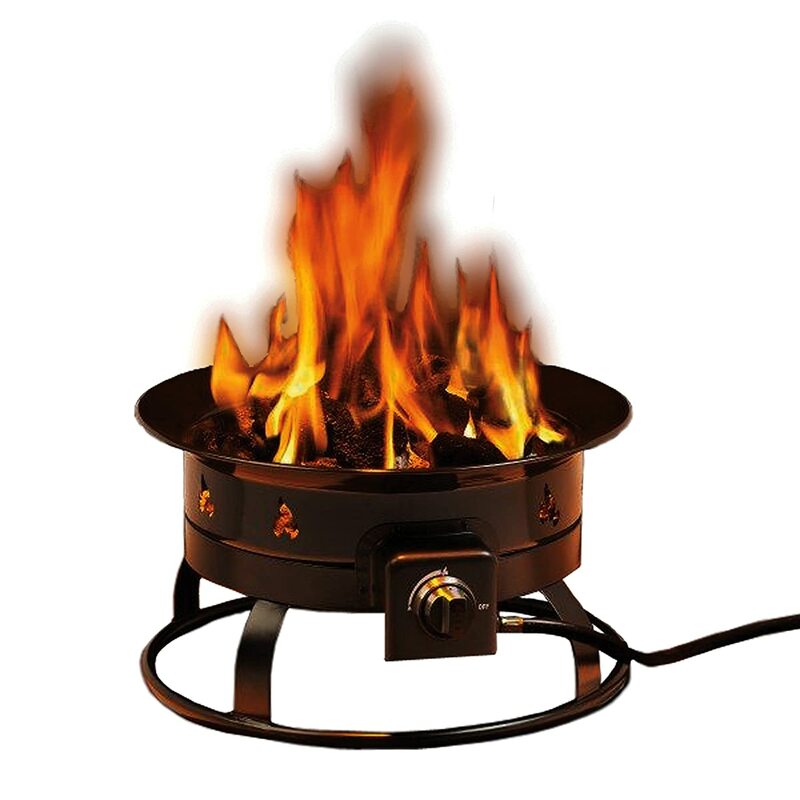 Many consumers highly recommend this fore pit as the perfect accessory to take any camping trip that adds to the fun and emits enough heat to keep the gathering warm and cozy. 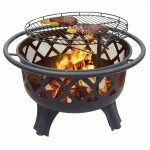 The Camp Chef Redwood pro fire pit is the easy way to stay warm when away in camp or at home on your patio. 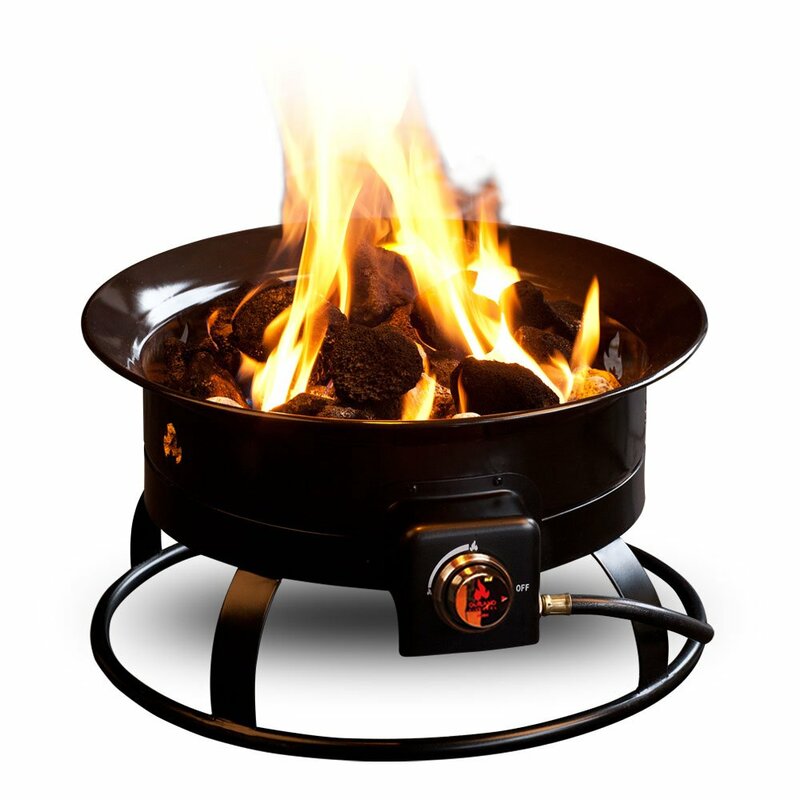 This easy to use portable fire bowl has auto-ignition features and also has an adjustable flame control dial which helps to keep the flame just at the right size you want it. 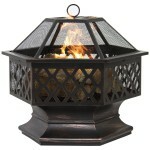 This fire pit is rated 53,000 BTU and is propane powered with shut off valves for added safety at all times. 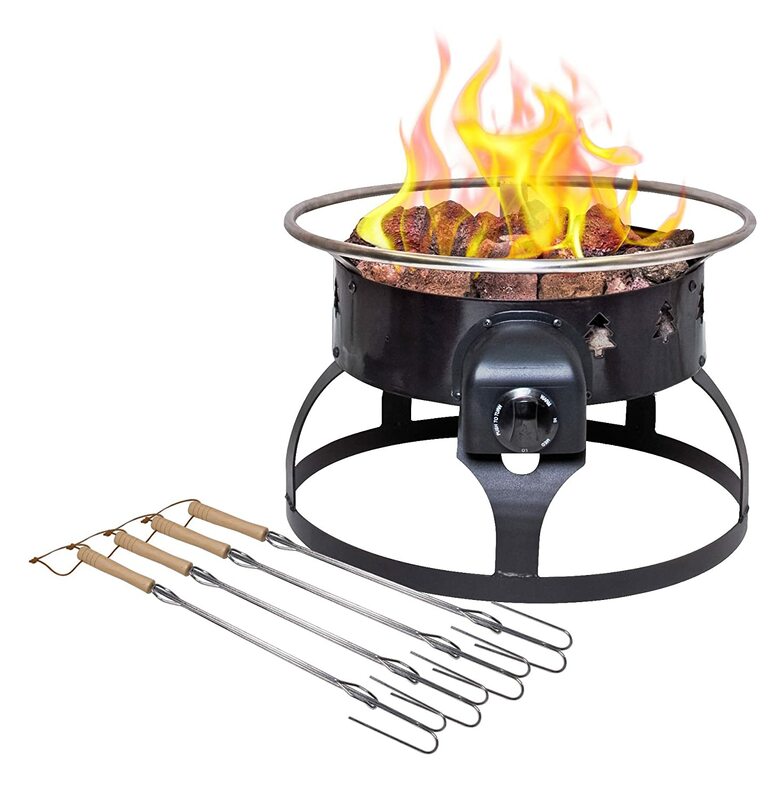 It also comes with a set of four roasting sticks for cooking your hot dogs or roasting your marshmallows while you enjoy the warm cozy fire. Produces enough heat for a small gathering. Long lasting fire pit with the correct care. Comes equipped with a safety shutoff valve- That prevents wastage and leakage of gas. Comes with a zipper carry bag- That is not only useful for portability but also for storage and protecting the fire pit from the elements. 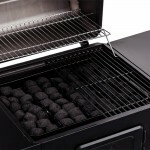 Also comes with additional fire pit accessories- Including 4 adjustable roasting sticks and lave rocks. for the burner. Fire pit tables are usually the more sophisticated version of the ordinary fire pit and while they are also great for warmth, they are also used to improve the functionality and look of the outdoor living area, transforming the outdoor area into a more elegant and classy space. Fire pit tables as the name suggests, take the look and shape like the usual coffee tables but with a fire burner in the middle and in most cases operate on natural gas or propane. The rest of the extended edges can be used to hold drinks, snacks or even to prop the feet. Most of the designs usually come with a hollow area inside them where the the propane gas tank is stored and concealed. This way it doesn’t interfere with the overall aesthetics of the fire pit table. The tank is usually accessible through an easy access door on the side or by lifting the table top. In addition to drastically improving the look of your patio or any other outdoor living space, fire pit tables are perfect for complementing other outdoor features and structures such as gazebos, pergolas, swimming pools and water fountains. On the downside, you cannot cook on a fire pit table, and you wouldn’t want to, as that would definitely ruin its’s look and reduce its lifespan. Overall, a fire pit table outlives a traditional fire pit with years- provided the correct care is taken, which we will discuss later below. Therefore, seeing as fire pit tables are designed more elegantly and bigger with a multitude of attractive materials, features and designs, it’s no surprise that a fire pit table is more expensive with prices ranging from $200 to as high as $3500 or even more. So, if you have the money and the space, a fire pit table is definitely something worth considering. 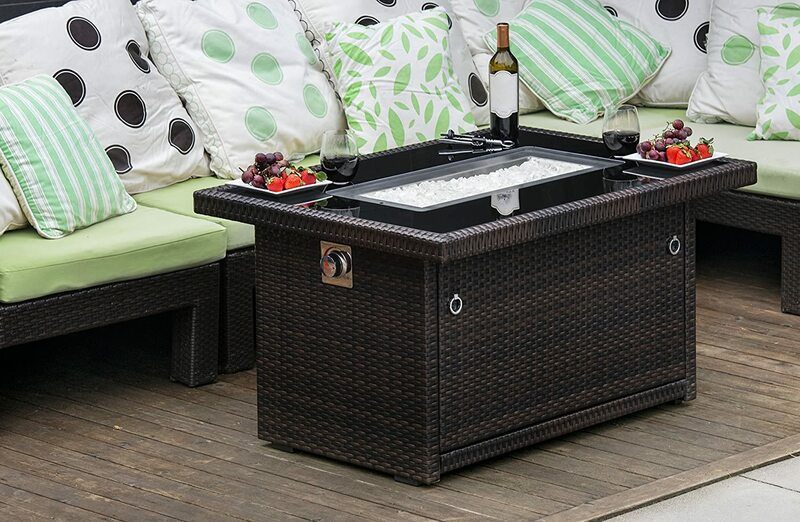 This elegant high-quality propane fire pit table makes a perfect addition to your outdoor living space. This 35,000 BTU fire pit table features a weather resistant powder-coated aluminum frame and a heat and weather resistant resin wicker base which makes it extra durable and suitable for all weathers. The black tempered glass tabletop is not only attractive but also perfectly conceals a standard propane tank and reflects the flames perfectly for a lovely ambiance and added beauty. The interior compartment where the propane tank is stored is easily accessible. This fire pit table has an impressive heating radius to ensure everyone around the pit stays warm and measures L 44” x W 32” x H 23”. Gives off a decent amount of heat. 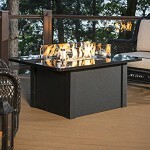 Very popular fire pit table with very high ratings. Durable all-weather construction for guaranteed longevity. It’s an attractive unit that would suit most outdoor living areas. Comes fire pit glass to accent the frames. 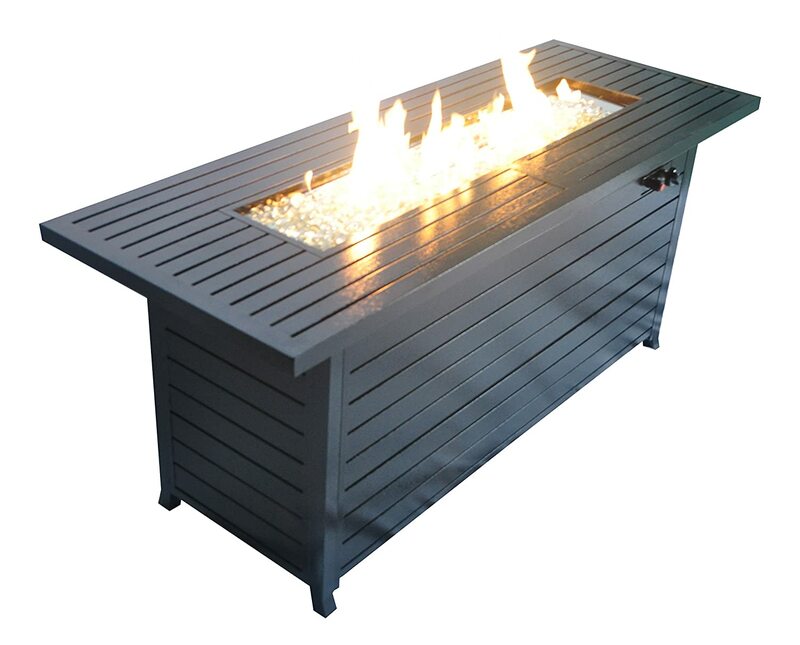 Customers commend the Outland company for such a well made and quality fire pit table and highly recommend it for its heat output and overall appeal especially with the dancing flames. This impressive looking Crawford fire pit table is crafted from from Magnesium Oxide and Steel with stone finish which to give that natural look that blends perfectly with any patio decor, backyard, pool area or any other outdoor living space. This Square shaped fire pit table is conveniently shaped for an all-inclusive seating possibility which ensures everyone at the pit gets enough warmth from this 40,000 BTU Propane Gas fire pit table. It comes complete with lava rocks for the fire pit burner and a protective cover for the whole fire pit table to protect against the elements and dirt. It measures 32 x 32 x 24 inches. Adequate amount of heat output. The composite stone finish gives this fire pit that natural look that will perfectly blend with almost any outdoor. It’s quality constructed for durability. Includes arctic fire glass for more realistic and beautiful flames. Customers rate this fire pit table for being well built and great looking and also producing very robust and beautiful flames. Just like the above Outland fire pit table 401 series, this elegantly designed 42,500 BTU square propane fire pit is designed to be long-lasting with a powder-coated aluminum frame as well as resin wicker material and black tempered glass table top that are weather resistant making this fire pit table quite durable for daily usage. Adequate amount of heat production. Superior all-weather construction for guaranteed long lifespan. 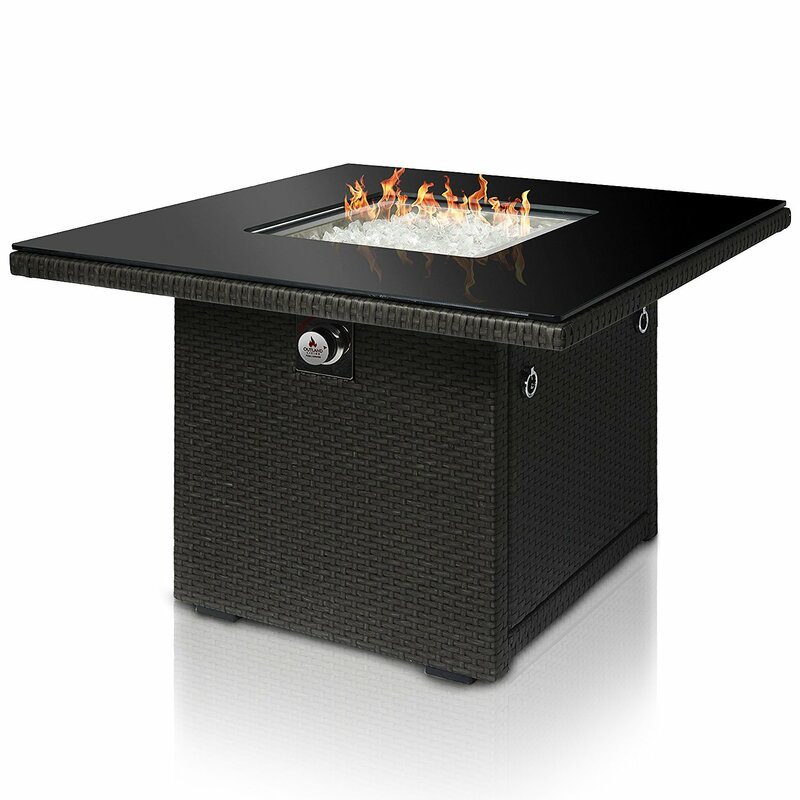 This unique top quality luxury fire pit table has an astounding BTU rating of 60,000 BTU. It features a lovely mix of the antique and state of the art beauty with a rustic bronze finish that settles in nicely into your outdoor area. The table’s aluminum frame ensures that it stays rust free for a long time to come while the stainless steel burner has drainage holes in it to dispense any rainwater that may get into the burner. Aside from the elegant design, this table also has incredible functionality in delivering heat and light to your outdoor space. As a safety precaution, this fire pit table comes with an automatic gas shutoff valve that automatically cuts off the gas supply and prevents leakages when the flames are disrupted. Provides sufficient amount of heat. Thermocouple valve shut off safety feature. Attractive addition to any outdoor space. Customers love the quality of this fore pit table and that is easy to set up and delivers what it promises it terms of heat production and performance. 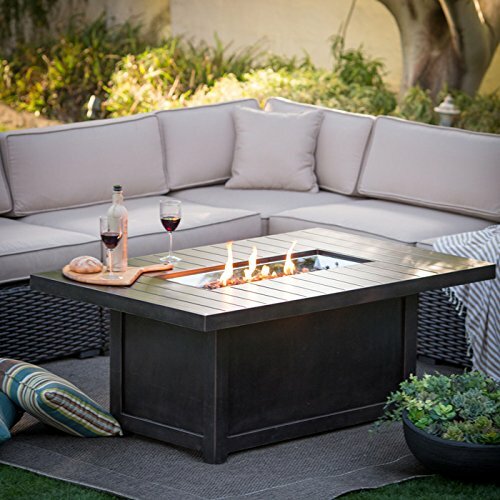 This rectangular shaped aluminum fire pit table is designed with a rating of 50,00 BTUs. Built with highly durable stainless steel burner, this sturdy fire pit table has a hammered black finish which helps to protect it from damage by the elements. In addition it comes with an extruded aluminum lid for the burner and a bag of clear fire glass. Perfect addition to most outdoor space. 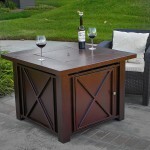 Includes a lava glass and table lid to transform it into a full table. Customers rate this fire pit table for looking great and putting a great amount of heat. Not leaving your fire pit outside exposed to weather elements. Using a protective all weather cover to protect against the elements when the fire pit/table is not in use, even when it’s inside the house. Not roasting anything on a fire pit table. Occasionally repainting of the metal parts of the fire pit with heat proof paint. Whether you chose to for for an ordinary fire pit or a more elegant fire pit table, there is no doubt that your outdoor living experience will drastically improve while you enjoy flickering of the flames and the feeling of warmth creating that perfect night time ambiance. It’s worth noting though that as winter approaches, a gas fire pit, depending on brand may in itself not do a great job of you keeping very warm, so we recommended complementing it with a heater if you find your gas fire pit insufficient. It is known fact that a wood burning fire pit will do a much better job of providing more than enough heat to keep warm. So if you don’t mind the smoke, starting the fire from scratch and the ashes afterwards, a wood burning fire pit is the best way to keep warm during those very cold winter nights. Otherwise the above gas fire pits will as well do a decent job of providing heat and keeping you relatively warm.